US military units reach Linz on May 5, 1945. The Linz factories are seized in their capacity as “German assets” and renamed Vereinigte Österreichische Eisen- und Stahlwerke AG (VÖEST) in accordance with two orders of the US military government dated July 18, 1945, and October 1, 1945, respectively. They are also spun off from Alpine Montan AG. Public administrators are commissioned to manage the plants. The gradual work to repair the damage and provisionally start up individual facilities begins right after the end of the war, but the fate of the Linz plants is difficult to predict at the time. Intense differences of opinion erupt with respect to the plants’ continued existence. It is even debated whether they should be torn down altogether. Protracted negotiations and interventions precede the factories’ continuation. The decision to continue operating the Linz plants also triggers substantial changes in the region’s economic structure. Yet the actual, full-blown reconstruction and expansion of the facilities does not begin until the Commander-in-Chief of the US Forces in Austria, Mark W. Clark, transfers VÖEST in trust to the Republic of Austria on July 16, 1946. VÖEST is subsequently nationalized on July 26, 1946, pursuant to the first Austrian Nationalization Act. 1947 sees the first firing up of a blast furnace since the end of WWII. The 1948 Iron and Steel Plan, which is prepared by the Ministry for the Protection of Assets and Economic Planning as well as the Ministry of Trade and Reconstruction, aims to coordinate the growth of the iron and steel industry and thus serves as the blueprint for the allocation of funds under the European Recovery Program (ERP), more widely known as the “Marshall Plan.” The production of commercial sheet steel is concentrated in Linz. 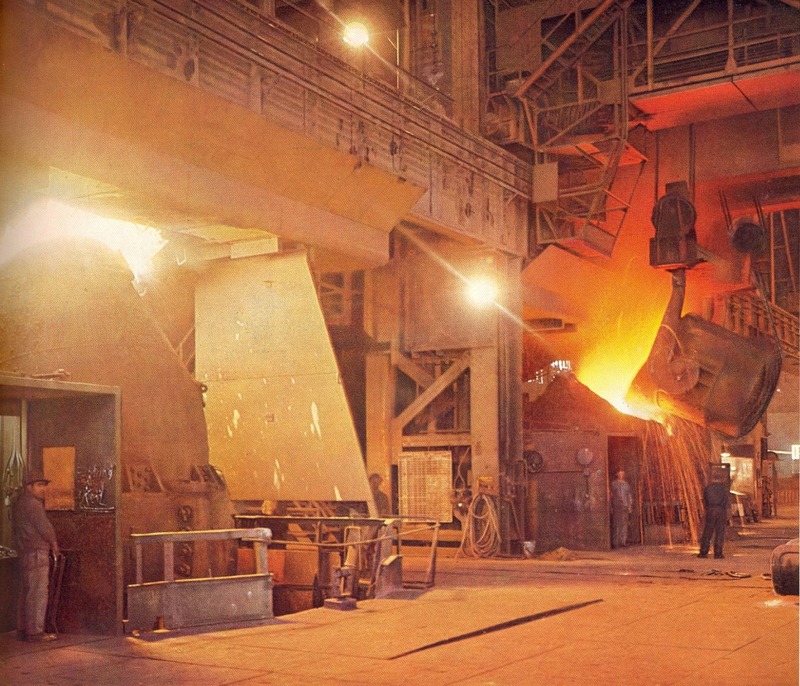 Nothing contributes more to VÖEST’s image in its early years and nothing has a greater impact on the company’s fortunes than the development of the Linz-Donawitz basic oxygen steelmaking process (the “LD process”). This innovation lays the foundation for an internationally competitive Austrian iron and steel industry. Scientists in Linz achieve the breakthrough after many years of work, both at home and abroad. The successful tests lead to the decision in December 1949 to build the world’s first LD steelworks in Linz. The (re-)construction of the Linz steelworks proceeds at a rapid pace. The slab mill goes into operation in 1951. The world’s first LD steelworks as well as the hot strip mill with a rolling line that has five rolling stands—one of the largest investments during the immediate post-WWII period—are officially started up in early January 1953. The cold rolling mill follows in October 1953. The investments of the first expansion phase are largely completed in this and the following year. 1954 sees the addition of the Liezen steelworks to VÖEST pursuant to an operational lease. Following the signing of the Austrian State Treaty in 1955, VÖEST takes over the management of the Krems steelworks, which until then had been under Soviet administration and thus not subject to Austrian control. In order to be able to provide adequate housing for its (new) workforce, in 1953 VÖEST launches a housing and resettlement program as well as a program to build apartments at its two new sites, Krems and Liezen. VÖEST’s social policies range from affordable housing, to employees’ medical care, all the way to childcare on the company’s premises.